Lord of the Rings is my favourite film (cos I think of it as one loooooong film) of the past 30 years. That, then, is the definition of a hard act to follow. 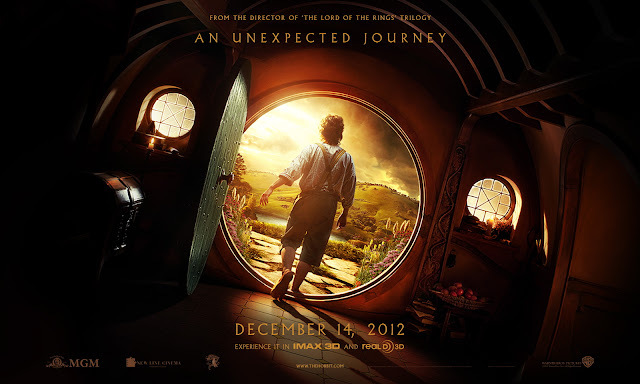 With that in mind, I’ve watched the development of The Hobbit over the years with a mix of hope and trepidation. I was distraught when Jackson said (effectively) that he couldn’t face making another. Then I was mollified when Del Toro took over because, I thought, he’d keep it dark and extraordinary. When he got tired of the delays and left I was genuinely concerned … Then, when Jackson said he would do it after all, I celebrated. But the delays continued … Studio and rights issues, union and political problems … A threat to shoot somewhere other than New Zealand (which we all now know is Middle Earth). It looked like the film was cursed. To be fair, all of this is not that unusual in large-scale movie making but, in this case, it all happened very publicly. Thankfully, it was all well worth the wait. "You feel there's something calling you ... You're wanting to return ... To where the misty mountains rise and friendly fires burn ..."
For me, watching The Hobbit is like returning home after a long time away … It feels comfortably familiar, yet things have changed noticeably. I’ve seen it twice now, once in proper 2D and once in 3D gimmick-o-scope. You probably already know my thoughts on 3D so I won’t revisit them but, suffice it to say, the only reason I inflicted 3D on myself was to see the 48 frames per second presentation. This had been so controversial, I just had to make my own mind up and, given the controversy, this might be my last chance as there may never be another widely distributed film in so-called HFR (higher frame rate). The 48 frames do make a significant difference to the viewing experience – akin to that of stepping-up from DVD to Blu-Ray – and it can be distracting, so I’m glad I watched the film in traditional 2D first, simply so I could concentrate on the story, the acting and the overall feel. 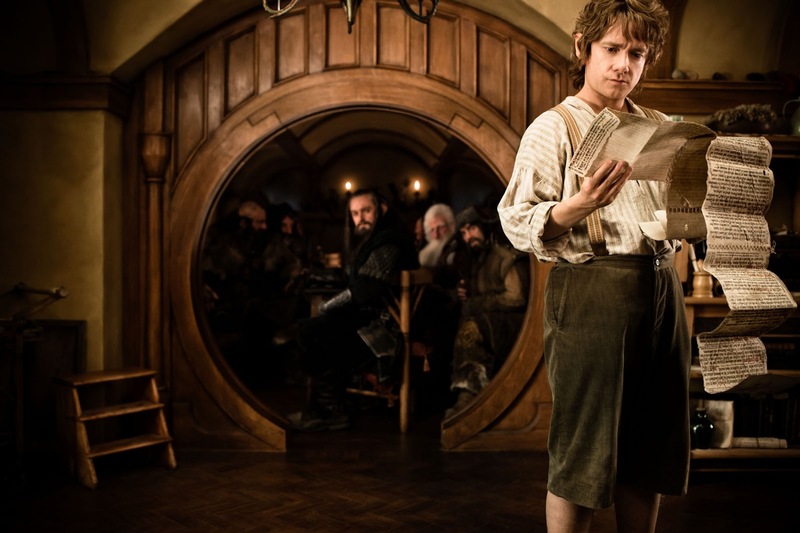 “I’m not the same Hobbit I once was” opines Ian Holm as old Bilbo, looking at a drawing of Martin Freeman as young Bilbo. This starts things off with a nice nod and a wink to the audience. It does cross my mind that I do hope we won’t get a belated ‘Special Edition’ of Fellowship, with the flashback of Ian Holm's Bilbo finding the ring replaced with Freeman's re-staging of the same scene. I’m confident we won’t though because Jackson, after all, isn’t George Lucas. "No wait, here it is in the small print: ' ... Reserves the right to suddenly turn two films into three without warning.' Seems fairly watertight, chaps. No series three of Sherlock just yet, then ..."
As he did with the opening moments of Fellowship of the Ring, Jackson gives us a flashback to a moment of historical significance which lays the foundations of the current dilemma. In LOTR it was the defeat of Sauron and the failure to destroy The One Ring, here it is the loss of the city of Erebor to the marauding Fire Drake, Smaug. Because Jackson is a tease, he gives us the Dragon’s spectacular attack and capturing of the city, without letting us get a good look at it, there’s a taloned foot here, the tip of a spiky tail there, the shape of a wing and, eventually, a close-up of an eyeball. But the big reveal will, of course, be saved for a dramatically expedient moment in the next film. He pulls the same trick, just as effectively, when Radogast’s tree-house is being besieged by giant spiders. We see legs and shadows and a genuinely chilling shot of the furry-elbowed arachnids stalking away through the woodland foliage. The full horror of them will be revealed next time. Not sure how he’ll top Shelob from Return of the King, but we shall see. Of course, the presence of these spiders, along with Radogast’s dire warnings about ‘The Necromancer’, are ingredients we should recognise … They are dramatic fore-shadowings … The seeds from which grow the dangers of LOTR. When Gandalf’s wizard superior, Saruman, appears he is already equivocating over the danger posed by Mordor and we all know where that will lead in just sixty short (by Middle Earth standards) years. Getting back to the loss of Erebor, it explains why, in Lord of the Rings, Gimli distrusts Legolas because Thranduil, the Elf King (and, not incidentally, Legolas’ father), refuses to get involved in the fight between Dwarf and Dragon and thusly earns the eternal enmity of the Dwarven folk. 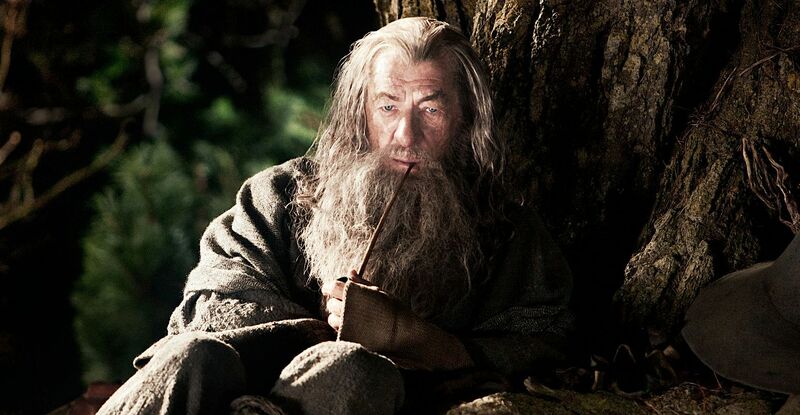 And so the framing device ends with old Bilbo sitting quietly, on the eve of the party that launches The Lord of the Rings, reminiscing and blowing a smoke-ring which, as this films sub-title ‘An Unexpected Journey’ appears, is a reminder of another ring still, at that point, very much on Bilbo’s mind. "To think I should have lived to be good morninged by Belladonna Took's son, as if I was selling buttons at the door!" 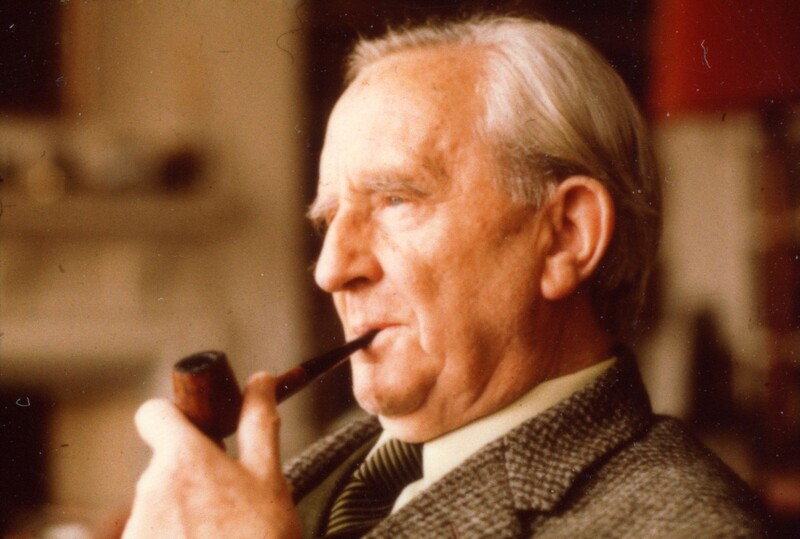 And so we are introduced to young Bilbo, sitting on the same bench sixty years earlier, smoking the same pipe weed, played now by Martin Freeman who immediately proffers his trademark perplexed look as his view of The Shire is blocked by a rather shambolic grey wizard. Gandalf is exactly as I remember him from the Bag End scenes in LOTR which, in itself, is an impressive achievement given the twelve years that have passed since those scenes were filmed and these. 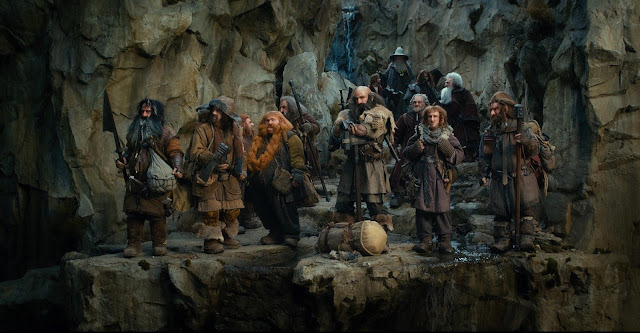 Soon after this, our new cast-members begin to arrive, initially in ones and twos, then in one heaving mass, we meet the thirteen Dwarves of the new fellowship. 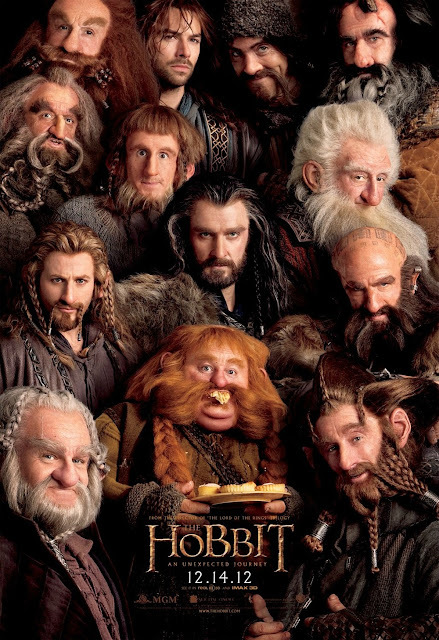 I know that having thirteen Dwarves plus one Hobbit and one Wizard was a major headache for Jackson and co. because they simply didn’t know how to present so many new faces in a way that we, the poor beleaguered viewer could remember them all. Well, frankly, I’ve seen the film twice and I still don’t know all their names nor have a grasp on all their personalities but that’s okay; this is, after all, the first part of the story. We have many hours to get to know them before we’re done! The Dwarves are played by a cadre of (predominantly) Celtic thesps, led by Yorkshireman (and therefore, you might say, thinking woman’s Sean Bean) Richard Armitage. He is Thorin Oakenshield, who was there at the fall of Erebor and, again, at the battle of Moria when it was overwhelmed by the Orcs who still lurk in its stygian depths when Gandalf returns there sixty years later. Thorin and his kinsman, Balin (played by sagely Ken Stott) are the old guard, this film’s links to their culture’s noble past now fallen on hard times and, as such, they exemplify the dignity and restrained aggression that Aragorn brought to LOTR. We see Thorin battle the Pale Orc, Azog, who will be our antagoniste du jour. A feud burns between these two which will fuel the latter scenes of this film and will continue to burn, no doubt, in the next one. Thorin’s grabbing of an uprooted tree-stump to use it as a shield (and thusly earning his moniker) is one of those mythic moments which makes my skin tingle with its authenticity. This is exactly the kind of moment one finds in real myths. We are also told that his father, King Thrain, who had hoarded all the gold in Erebor, had been driven mad by its loss and simply disappeared. One imagines that he’ll be back subsequently, possibly in the final part of what will now be a three-part treatment of this story. "Have I ever said: I love that eye-liner on you, it really makes your eyes sparkle?" This, once again, gives us a thread to connect with LOTR as that story was entirely driven by the failure of kings and other leaders. From Isildur’s initial failure to destroy the ring, to King Theoden’s torpor, Saruman’s greed and Steward Denethor’s mad jealousy, every leader in Middle Earth failed their people. This, I feel, was a significant part of Tolkien’s message, reflecting on his own youth as a victim of the political incompetence which resulted in World War One. Tolkien himself, of course, vigorously denied any allegorical content in LOTR, in the Foreword to the revised edition, he states: “As for any inner meaning or 'message', it has in the intention of the author none. It is neither allegorical nor topical … The crucial chapter, "The Shadow of the Past', is one of the oldest parts of the tale. It was written long before the foreshadow of 1939 had yet become a threat of inevitable disaster …” Well, far be it from me to argue with the great man but the very nature of subtext is such that an author may not be personally aware of it, may not intend it and, certainly, may deny it. Please note that he does take the trouble to include that all-important ‘in the intention of the author’ clause, so it seems he was conceding that it may be there, but not by his deliberate design. After all, he was writing during the period when the country was sinking towards, then engaged in, then recovering from the second Great War of the generation. During this time, from the rarefied halls of academe, he will have seen many of his students drawn to the flag and that surely must have stirred up memories of his own youth when he had fought in the first war. As he continues in the Foreword: “One has indeed personally to come under the shadow of war to feel fully its oppression … to be caught in youth by 1914 was no less hideous an experience than to be involved in 1939 and the following years. By 1918 all but one of my close friends were dead”. In a time of war, he wrote about war … How can his circumstance not have influenced his mood, his creative decision-making and his conclusions? Any similarities between Tolkien and Gandalf are not in the intention of the film-makers. But The Hobbit, a children’s fable, is most decidedly not about war, neither in its text nor its subtext. It is about introducing us to a fabulous world, from the point of view of an innocent, child-like in bearing and experience, but surprisingly bold in demeanour. Bilbo has only the vaguest notion of the depth of history, politics and the vagaries of civilisation that have formed the world into which he steps. Are any of us any different when we first venture forth? And so the merry band set off on their heroes' journey and Jackson gets to unleash the gratuitous use of spectacular New Zealand landscape that gave LOTR such a particular look and, co-incidentally, did wonders for the New Zealand tourist trade. These new Middle Earth vistas are every bit as beautiful as those with which I am now familiar. Oh, good! Radogast is only the third wizard we have met (although, to be fair we’re only likely to meet three as Tolkien only invented five and didn’t trouble himself much with the other two ‘Blue’ wizards, the names of whom Gandalf can, pointedly, not remember). He is played wonderfully by Sylvester McCoy who, essentially, plays himself. Stuntman, mine-artist and all-round eccentric, McCoy has always been a natural entertainer. In person he comes across as something of an overly-enthusiastic uncle, delightful for kids, embarrassing for adults and Radogast, with birds in his hair and his mugging, eye-rolling performance, is exactly like that. The Seventh Doctor thinks being a Wizard is for the birds. (Sorry). As we are introduced to him, he is fighting an epic battle to save the life of a hedgehog. But why not? Having your protagonist be a member of the physically smallest, least adventurous race on earth clearly shows a willingness to acknowledge the value of every life – however seemingly insignificant. Whilst Saruman disdains Radogast as a fool, Gandalf is himself not so foolish as to think bearing the demeanour of a fool necessarily makes one such. As he later confides to Galadriel: “I have found it is the small things … The deeds of everyday folk that keeps evil at bay.” That, right there, is the overarching message of this whole series of films in a sentence. God – if Middle Earth had any such thing – would be in the details! It is an interesting point, I think, that McKellen and McCoy have worked together on stage as, respectively, Lear and Fool. Their relationship is well established and deep and that comes across immediately here. Finally, before Radogast disappears completely from the film (hopefully to return in the next one) he breaks out his quite wonderful sleigh, pulled by his team of Rhosgobel Rabbits. Now that beats shanks’ pony as a way to traverse Middle Earth! Bilbo is soon advised by Gandalf that true courage “ … is not about knowing when to take a life but when to spare one” which is, of course, why he spares Gollum. Of course, one could argue that Frodo and, indeed, Gollum himself, might be better off with him put out of his misery … but he isn’t genuinely dangerous and I seriously doubt that Frodo and Sam would make it to Mordor without him. So leaving him alive is investing in the future of Middle Earth and the ultimate defeat of Sauron by human (or, rather, Hobbitual) decency! No? Suit yourself. I love the decency of the characters as demonstrated in the details: Thorin waits for all of his men to escape down the chute to Rivendell that Gandalf has discovered, before heading down himself. He, needless to add, is not a ruler who fails his subjects. Later, when the dwarves are surrounded by full size horses with weapons-wielding Elves riding them, they form a defensive circle and instinctively pull the helpless Bilbo into the centre of it. They may be intimidated and hopelessly out-classed, but they don’t let that imperil there instinctive sense of comradeship and decency. He may only be a ‘Hobbit Burglar’, but he’s one of them and, as such, an equal. Even Gandalf is not without his human foibles. As the iridescent Galadriel bids him farewell and disappears … Gandalf is left alone and, just for a moment, distraught … So deeply smitten with her is he. Apparently some people have complained about the pace of this film, beginning, as it does, with well over half an hour of characters arriving, eating and doing not much before taking a leisurely stroll to, initially, Rivendell. But, mayhap, the complainers have forgotten that that is precisely how Fellowship began, with time for the viewer to adjust to this new world and this panoply of bizarre new characters. It’s possibly also worth mentioning that the film was originally intended to be the first half of the story, and has been re-worked so that it is now just the first third … That must have had some effect on the pacing of the movie. Must have. But when the trilogy is complete I am confident that the pace will seem perfectly appropriate. Getting us to revisit familiar (and welcome) places like Rivendell, to show us fondly remembered characters like Elrond and Galadriel and the less-well-thought-of Saruman, is a short-hand way of helping us to identify with the familiar elements from the films we know, so to help us cope with the elements we don’t. This isn’t simply an exercise in nostalgia, mind, as Jackson and Co. have achieved something quite different here, not least in the technical innovations of shooting so many special effects in 3D and at 48 frames per second. Particularly noticeable in these early scenes, but present throughout, is one of the key differences between this film and LOTR … The glow. Many of the characters’ faces and, sometimes, the environments in which they walk, have a hazy shine about them as though they are glowing with inner magic. I know that this is a product of post-production digital colour-grading and, initially, I found it quite distracting but then I settled into it because, after all, this film is set in an early, more innocent, less doom-laden world that LOTR. In that world only The Shire is untouched by Sauron’s blight but, sixty years earlier, the whole world is going about its magical kingdom business, being a place of wonder and fantasy … So why wouldn’t things have an innocent, magical glow? Hang on, have my eyes gone funny? It's this bloody eye-liner, isn't it! Whilst, as you probably know, I can’t see in 3D, I’m told the experience here is a very comfortable one, with none of the eye-strain that some people experience in normal 3D. Of course, that means nothing to me because I’m just watching a flat film, no-matter how many dimensions they’ve made it in. I mostly watched this film oblivious to the dimension I was missing – save for the very few cheapo 3D gimmicks they’ve thrown in – such as having Gollum almost walk into the camera to emphasise just how much he hates Bagginses. Thankfully, these distracting shots are few and far between and the film, by and large, moves the camera and the viewer’s eye around the screen very much as it would were it 2D. As to the HFR … I could see a difference almost immediately. In the panning shots over the city of Dale there was no strobing, as there often is with sideways movement. The image was clear as a bell and camera movement was correspondingly smooth. The additional detail was genuinely starting. It is like the screen isn’t there and you’re looking through a hole in the wall to another world. In the feasting scenes, I genuinely felt like I was sitting amongst the dwarves. Surely, that’s the effect the film-makers have been striving for since … Forever. But definition of this incredible height reveals the reality in a way that, maybe, Jackson and Co. had not banked upon. Some of the sets now look like sets … Particularly Bag End, the pony stockade and Troll camp and a lot of the stone-work looks like the painted plaster it really is. This same clarity also reveals the limitations in some of the special effects, which betray the reality of an actor standing in-front of a green screen reacting to something that will be added months later. The approach to Rivendell not only looks like painted styrofoam in HFR but, thanks to some bizarre auditory illusion, it also sounds fake underfoot! There is a lot of light and a considerable depth of field, meaning that a lot of what you see is in focus. I suspect this is at the behest of the 3D, as it would be difficult to separate the image into layers and separate them, if they aren’t initially in focus. This effect takes away from the cinematic feel of the viewing experience and makes the film look more like TV from the 1980s, when the video cameras needed a lot of light and a wide-open aperture to record the image with fidelity. But, oddly, that effect was okay; it reminded me of fantasy TV shows like Doctor Who and Sapphire and Steel and the BBC’s version of Narnia, shows for which I have considerable affection. So, in an unexpected way, the nostalgia I felt in revisiting Middle Earth was heightened by a nostalgia I felt for the TV shows of bygone decades. Of course, all is not exactly as we (who have not read the book) expect. The hint’s in the film’s sub-title, after all. The scene where two Stone Giants clash (essentially two mountains throwing smaller mountains at each-other) seems just a scene too far – betraying the child-like ambitions of the source novel rather than the rational maturity of its sequel. Never-the-less, Jackson and Co. strive to make this complete fantasy as credible as possible, lighting it in (probably more than fifty) shades of grey and creating real suspense. What could have been ridiculously over-the-top is possibly the most spectacular sequence in a thoroughly spectacular film. It’s a moment of pure Harryhausen and I mean that as the highest compliment! Other subtle differences are to be found in The Orcs, they are stranger than their ancestors will be sixty years hence, they do not speak English and they are almost all CGI creations now rather than the more obviously humanoid mime-artists in suits. This is testament to how far CGI animation has come in the ten years since our last visit. Then, Gollum was a remarkable achievement whose only real antecedent was the risible Jar-Jar Binks. Now, he is just one of a multitude of completely convincing animated characters, each with their own personality. Thanks in no small part to the pioneering work done for LOTR by Andy Serkis (who, of course, returns as Gollum for a cameo, then spent the rest of the shoot behind the camera, directing the second-unit action scenes) motion capture (or 'performance capture' as they prefer to describe it these days) has now become the way to create believable performances and breathe life into the wildest of CGI creations. Click to enlarge and take in the incredible detail of this entirely CGI image. 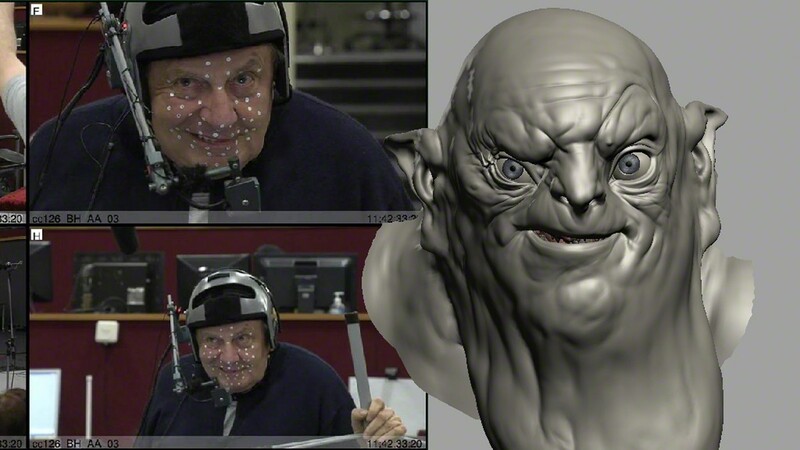 "More real than real" would seem to be Weta's motto. Given how used we have become to life-like animations, I was pretty concerned that Gollum would have to be pretty special to impress now, yet they couldn’t really change anything because that would be to betray my memories of him from LOTR. I needn’t have feared … Serkis’ performance is masterful, a complex mix of pathos and humour and bestial rage, while the computers have whipped-up an extraordinary visual creation entirely suited to this sharper, clearer, brighter world, yet still unambiguously the same tortured soul we know so well! Serkis shows the duality of the character, he bickers with himself and changes mood in mid-sentence. He is by turns vulnerable and dangerous, loathsome and laughable and, ultimately, sympathetically sad. Given his bi-polar nature that is perfectly proper but it’s an extraordinary feat for them to have given so much personality to a cloud of pixels. 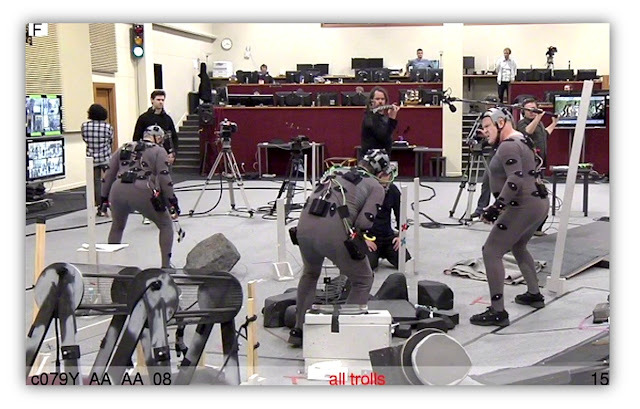 Both the Troll and Goblin sequences rely heavily on the perf-cap technology. They also are great examples of Jackson's habit of keeping people busy during his notoriously long and complicated shoots. The Trolls are played by William Kircher, Peter Hambleton and Mark Hadlow who are, out of those fetching skin-tight costumes, also the Dwarves Bifur, Gloin and Dori respectively. He also offered a laurel-branch to Australia by employing Dame Edna herself - Barry Humphries - as the voice and face of the Goblin King. Even the loathsome Les Patterson couldn't have played this without make-up. This sequence – largely played out in long shot as the gang fight their way through the tide or Orcs (or are they ‘Goblins’ … They don’t seem entirely sure) – stays just the right side of the Super Mario platform-game effect that the similar scenes in the Mines of Moria had last time … again because of the huge improvement I computer processing power and the sophistication of the software. I confess, even as someone who is rarely impressed by sheer scale in a move, I thought these scenes were extraordinary in HFR. I don’t think I’ve ever seen imagery so clear, so immersive. Well presented, a 48 fps image genuinely is the theatrical equivalent to the step-up from DVD to Blu-Ray. The ridiculous fall down the crevasse, surfing the bridge as it breaks apart, a sequence even more preposterous than the hanging dinosaur fight in King Kong, even less feasible than the rocking-stone-archway in LOTR … Somehow seems completely convincing in HFR. Indeed, the scenes immediately afterwards, on the hillside, when the CGI avatars are replaced by human actors once more, actually feel like something of a letdown after the razor-sharp hyper-real clarity of the Goblin Chase. It’s fair to say that Gandalf has a habit of saving the day at the last minute. He conveniently turns up at the Cave Troll camp just in time to stop them spit-roasting Bilbo and the boys, then arrives once again in the veritable nick, to save them all from the hoards of the Goblin King. I hope they don’t keep playing this card, because it has already become predictable and will soon make the transition to corny. Thorin butches up for his showdown with Azog ... Little does he know who'll save the day. 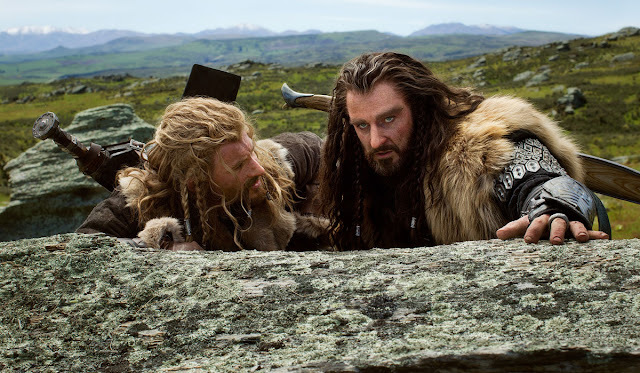 When Azog and Thorin make eye contact we’re into a world of slo-mo as they face off. I’m a sucker for melodramatic slo-mo, me. This battle, in the burning woods, is just as dramatic as Sean Bean’s face off against the Uruk-Hai at the same point in Fellowship. Any other film series and I’d be criticising it for following its own template too closely, but I can’t do it here … By this point I couldn’t see anything but good. The last Hobbit standing. Howard Shore’s epic choral work. The Giant Eagles. Yes, yes and yes. I even accepted that Gandalf saved the day again. That’s why he’s there, after all! Some might protest: Why don’t the Eagles take the Dwarves all the way to that mountain, instead of dropping them on the randomly-chosen peak of another. Well, where would be the fun in that? When two hours and forty minutes suddenly came unexpectedly to an end, I was distraught … I didn’t want the journey to end. I can’t wait for it to resume. I confess that I still don’t know the names of all the dwarves off by heart, but it’s (relatively) early days yet. Sure, I have some concerns about the decision (apparently taken as late as last Easter, when a year of principal photography was all-but over) to expand the films from two to three. As I've mentioned, I haven't read the book, but I understand the concerns of those who have, regarding him having enough material with which to fill three films. But there is also a library of books published by Tolkien's son, filling-out the entire history of Middle Earth. There is no shortage of stories to tell, absolutely no lack of material from which to cut the movie's cloth. I understand that the cast are re-assembling for three more months of shooting. They may refer to them as 're-shoots', but three months ... That's longer than most movies take to make. My only real concern is over the pacing of the narrative. A two-part structure is very different from a three-part one. The so-called 'three-act structure' is the backbone of all Hollywood movies. It has a tripod structure which is quite strong and well-balanced. To be honest, I am more comfortable with this structure than with the two-parter, however, it does mean some elements that we were told to expect are now not going to be on our screens until next December. Have a look at the banner below. Click it to enlarge and take a gander at the last three panels ... All of which are scenes which were intended to be in An Unexpected Journey but are now, unexpectedly, not. Whatever concerns I (or you) may have, I think it is undeniable that Jackson and Co. know their material as well as anyone and they have demonstrated - over four impossible movies - that they can be trusted with this material. The Hobbit is an extraordinary achievement, an entirely worthy companion to Lord of the Rings as well as an expansion upon and development of its spectacle and creative ambition. I’ve got two more films owed me and I want to enjoy every frame of them. And at 48fps that’s a lot of frames! As he did with King Kong in 2005, Jackson has allowed very detailed 'Production Diaries' to be produced showing the behind-the-scenes efforts that went into making this film. With Kong they came out weekly, sometimes several a week, and constitute an incredible vision of a big movie being made from the perspective of practically every participant however apparently insignificant their contribution. Many of these videos were released on a now hard-to-find DVD, which I encourage you to buy if you can. Incredible images with incredible resolutions! Quite a feast for the eyes. Thank you so much.